During sixth and seventh grades, I read all of SE Hinton’s books. Twice. The Outsiders, That Was Then, This Is Now, Rumble Fish, Tex and finally Taming the Star Runner… hey, can one serve someone in SE Hinton lore the way people have those dance offs? Because I totally could. For whatever reason, I requested a copy of Taming the Star Runner for Christmas this year, and I gobbled it up again in just a few hours – I read pretty fast, and when I’ve read the book before, I think I read a hair faster than normal. Also, please note I use the expression ‘a hair faster,’ not to be confused with ‘a hare faster,’ which is a totally different colloquialism. But in any case, it’s an easy read. 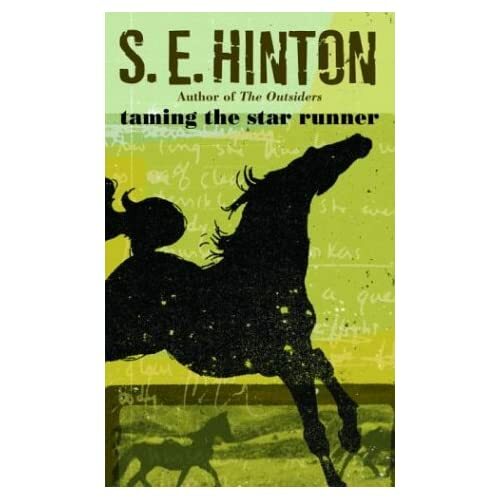 I’ve always thought Taming the Star Runner was Hinton’s… I don’ t know, oddest book? It feels the most divorced from the other ones, and not just because it doesn’t use any of her reoccurring characters. Something is different this time around – sure, Hinton’s first four books were published between 1968 and 1979, and TtSR didn’t come out until 1988… But it’s not just the first appearance of a little kid or a sympathetic parent figure or the fact that this is book is in 3rd person rather than first, like her previous novels… it’s not any of those things. It’s Travis. To summarize the book and it’s plot threads is not an easy feet, although the book is easy to follow. (I do maintain the first chapter or so is kind of a mess, but after that Hinton gets into a nice flow – that mess might have been intentional, as I’ll discuss below.) Travis has to leave home and move in with his Uncle Ken after he cracks his stepfather in the head with a blunt object in a fit of anger. Ken has a house on several acres and leases his barn to a horse trainer named Casey, who is a phenom and not much older than Travis. He ends up at a little hick school in Nowhere, Oklahoma (it’s Oklahoma, right? Hinton’s books always take place in Oklahoma… don’t they?) where he doesn’t fit in. Despite receiving poor grades in English, Travis manages to sell his novel, a strange twist: our angry, drinking, smoking, swearing and violent teenager is a sensitive artist who used to have a part-time job as a veterinary assistant. That seems strange to me. I get that characters don’t have to, and probably shouldn’t be, drawn flatly, but Travis is all over the damn place. Only luck, he realizes later in the novel, saved him from killing his step father when he hit him in the head with a fire poker. When Ken tells Travis he has to move out of the house because he threw a phone across the room during an angry conversation with his mother and nearly hit Ken’s soon to be ex-wife and young son, he reacts by bursting into tears. You know what the tough guy says? “I thought you liked me.” But he gets to stay, some other stuff happens and the book ends. When he was six or seven, he remembered thinking that teenagers were dumb and by the time he was twelve, he was dying to be one. Maybe it was going to be like that. Even Travis knew the difference between a couple of swats and a beating. Imagine getting his upside the head with one of THESE? Can you even imagine HITTING someone with one of these? Sheesh! Down, tiger! I think she’s just making chit-chat. But then you have these moments coupled with moments like these, it’s hard to know what to think. Travis had read it, but not at school. He just liked Robert Frost. Yep, it’s not enough that he’s well read when it comes to prose, he reads poetry, too. (It also comes up that Travis has read both The Iliad and The Odyssey.) The poem that is referred to, The Road Not Taken by Robert Frost, has been stuffed down my throat my whole life; I would think Travis had read it at school, but again, this is the pains to which Hinton went to paint Travis as a sensitive guy… who picks fights, drinks bourbon, smokes cigarettes and hit his step father in the side of the head with a fire poker. By the end of the second act, he’s practically having a panic attack. He seems pretty bipolar to me, and Hinton’s narrator isn’t helping any, so I guess you file that under the ‘unreliable narrator‘ section in your bookcase. So, although I never really picked up on it before, I came away from this reading (my third for sure, but it’s possibly my fourth) of Taming the Star Runner with the idea that Travis has bipolar disorder and the 3rd person narrator is unreliable. I guess I might be looking too deeply into the situation, as it is a book for teenagers, but then, it was over a decade between publications for Hinton and she tried a lot of other new stuff with this book, so maybe it’s safe to assume she was trying more than a teenager would catch on to. NOTE: My copy says ‘Taming the Star Runner,’ but the Amazon files say ‘Taming of the Star Runner,’ as does the image at top right. I have no idea which is correct – Wikipedia does not recognize the ‘of,’ and I guess it doesn’t really matter, anyway. Posted on January 12, 2011, in book reviews and tagged bipolar disorder, book review, books, Rumble Fish, se hinton, spoiler altert, Taming the Star Runner, Taming the Star Runner book review, Tex, That Was Then, The Outsiders, This Is Now, unreliable narrator, young adult fiction. Bookmark the permalink. 1 Comment.